Raylight Cutter: all the conversion features of DVFilm Maker plus editing, transitions, color correction, titles, audio editing and more! $45/month, no long-term contract, click here for more info. Make video look like film. DVFilm Maker is your 24P Conversion House! 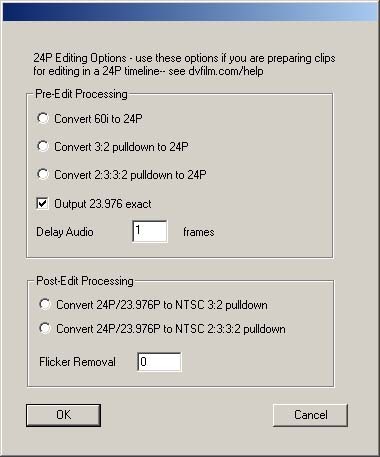 If you wish to edit at 24P, Maker converts from HDV/HD to 24P or NTSC to 24P and back to NTSC if desired. Maker has special support features for the Sony HDR FX1/Z1U the Panasonic HVX200, or the Canon XL-2 and Panasonic DVX100A, and Canon HV20*. Everyone's heard of the new 24P miniDV video cameras that achieve a real film-like appearance by sampling 24 video "frames" per second and then recording that to NTSC. But now you can achieve that look with any video camera, with DVFilm Maker. Here's how: shoot regular interlaced video with any DV camera: including Canon, Sony, JVC or Panasonic. And then convert the edited footage to 24P progressive-scan with DVFilm Maker. It intelligently deinterlaces HDV, NTSC or PAL video for a "shot on film" appearance, without reducing resolution. OR it can convert standard NTSC to 24P and back to NTSC, again without degradation of the image. It also converts 16:9 anamorphic to letterbox if required. It can also letterbox (crop) 4:3 video to 16:9 if required. It can also simulate film grain and red layer emulsion shift if desired. Converts 24P Advanced or Normal Mode to 24P for editing (click here for details). Will also convert normal interlaced video (60i) to 24P to import video shot with other cameras. Converts 24P back to 2:3:3:2 pulldown NTSC for non-recompressed archive to tape. OR converts 24P to 3:2 pulldown (film-motion) NTSC for broadcast. Will also convert MXF files from the Panasonic HVX200 to Quicktime or AVI. Can I use it to read and write AVI files? Yes, it will read and write AVI's directly. What capture card or editing system is it compatible with? Any Quicktime-based editing system, or any AVI-based editing system. If the output is 24P or 25P progressive-scan, will it play back on regular NTSC or PAL televisions? Can I use it on non-Firewire editing systems such as Matrox, Perception, Media-100, Avid, or Velocity? Yes, provided the editing system comes with a Quicktime or Video for Windows software codec. Do you have a version for the MacIntosh? Yes, click here for MacOSX info and ordering. How does it work? Is the de-interlacing method better than I can do with After Effects or with my DV editing software? Yes, much better. Nearly all plug-in and built-in de-interlacers reduce vertical resolution by 50%. 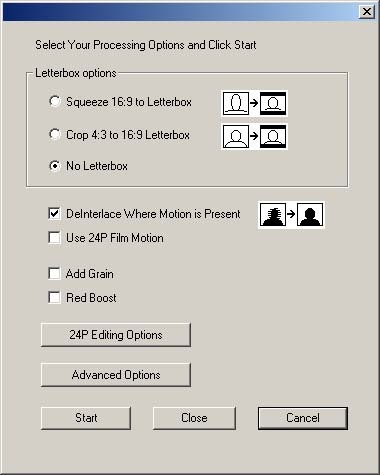 But DVFilm Maker works by analyzing motion in each frame, and only changing pixels in areas of the screen in which there is movement. This results in a much sharper image especially for scenes where the camera is still. Maker also detects horizontal lines and prevents aliasing, or "dot crawl". You will notice that the output video from DVFilm Maker is just as sharp and clear as your original footage, yet looks as if it were shot on film. Here is a comparison test. Is it better than Magic Bullet? Maker uses different methods and gets smoother results than MB, since Maker blends fields together instead of skipping fields when converting 60i to 24P. But it's also 10 times faster and 5 times cheaper than Magic Bullet, and runs without Adobe After Effects, itself an expensive and hard-to-learn program. What kinds of video can it convert to 24P? Can it convert the Sony HDV 60i format to high-quality 24P HD? Yes it can, see here for details. Can it convert Panasonic HVX200 MXF HD files to Avid HD Quicktime or Cineform HD AVI? Yes it can for the Windows version only, see here for details. Then download the demo version of DVFilm Maker here. The demo version works exactly the same as the release version, except that it burns the DVFilm logo into each output frame. How do I order DVFilm Maker? *Note: HD/HDV pulldown remove features and available in Windows version only. Join the discussion group on DVFilm transfers and DVFilm software, click here.